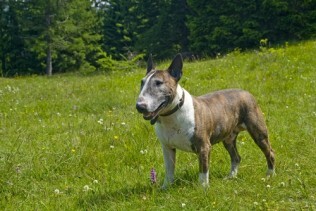 COLOR(S): White, brindle, any color with white markings on head. The Chow Chow is a member of the spitz family; it has been native to China for thousands of years. The two most distinctive features of the Chow Chow are its blue-black tongue and its almost straight hind legs, which makes it walk rather stilted. This breed is alert, independent and strong-willed; it is self-willed to the point of obstinacy. To their owner and family, Chow Chow puppies and dogs are friendly. Because of his thick coat it is unsuited for hot climates. A well-bred and well-socialized Chow Chow can be an excellent family dog. Chow Chow puppies and dogs are usually well mannered, but tend to be willful and protective. They are bossy, serious and very independent. Chow Chow puppies and dogs are often a one-person dog, very loyal to their family, though they may act reserved, even with them. This very dominant breed requires a dominant, experienced owner who is naturally fair and firm. Don’t expect great obedience from this breed, they are stubborn and with mind of their own. Be consistent at all times. Chow Chow puppies and dogs make excellent guard-dogs. Entropion (in turned eyelids), hip and elbow dysplasia, patellar luxation and heat sensitivity. Other health concerns include anesthesia sensitivity, cancer and bloat (gastric torsion). Bloat is a health issue to most dogs, being the second largest killer of dogs other than cancer, but Chow Chow puppies and dogs can be particularly susceptible to it because of their deep chests. hows have a tendency to be lazy but will be a healthier dog if given regular exercise like a good daily walk. Chow Chow puppies and dogs can be a challenge to train because of their strong-will. Training should begin early as a puppy, and is suggested for firm handlers.